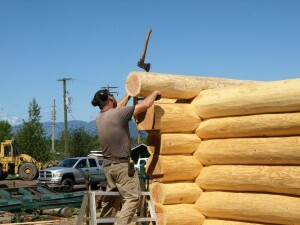 Cascade Handcrafted Log Home’s team includes the industry’s most talented professional logsmiths and scribers. 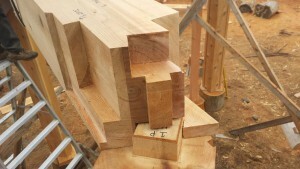 We’re passionate about what we do, and each and every home we produce combines that passion with superior craftsmanship, top materials, and a process that takes each client’s unique hopes and dreams for their custom log home into consideration. 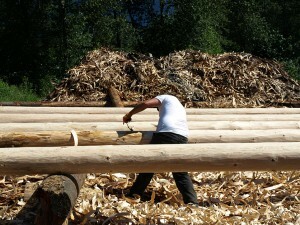 Here’s an outline of the tools we use when producing a handcrafted log home, and how they’re used. 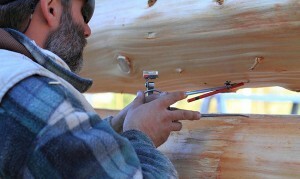 A scriber is a hand tool used in log home building to mark lines on the logs, prior to machining. 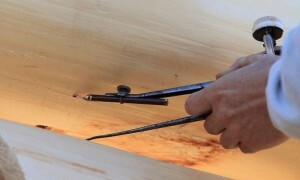 The process of using a scriber is called scribing and is just part of the process of marking out where the joins of the logs will be. A drawknife (drawing knife, draw shave, shaving knife) a traditional woodworking hand tool used to shape wood by removing shavings. It consists of a blade with a handle at each end. The blade is much longer (along the cutting edge) than it is deep (from cutting edge to back edge). 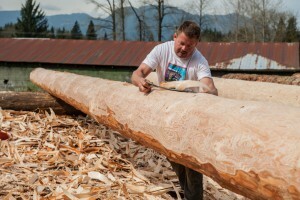 It is pulled or “drawn” toward the user, peeling off all of the unwanted bark or knots on the log. 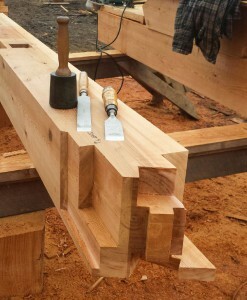 A finishing axe is a tool used by log home builders to shape, split and cut the wood. The finishing axe has a very sharp thin blade and is meant to shave off any unwanted growth on a log, or to fine tune the angles of a joint. An axe can come in many forms and specialized uses but generally consists of an axe head with a handle or helve. A slick is a large chisel, characterized by a wide heavy blade, and a long, frequently slender, socketed handle. These larger chisels are used as finishing tools for mortise and tenon, planing of door and window sills and notches. 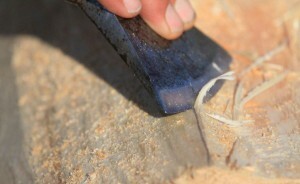 It can be sharpened to an edge on the two sides giving it an added versatility of being able to cut on three edges.